In the early 1930's Mrs. Charlotte Oakey moved to Bathampton to become become head teacher of the village school. She came from the village of Corston on the other side of Bath where she had already built up teams of folk dancers. 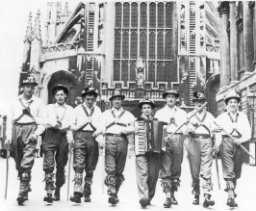 It was only natural that she included Morris Dancing in the activities of the schools Scout group and in 1934 "Mrs. Oakey's Boys" side was born. This side later grew into the "Bathampton Morris Men". The first Squire of the side was Dave Duncan who still danced with the side into the 1980's. By 1936 dancers from Bathampton were performing in public and achieved the first of their many successes at a competitive folk dance festival. The costume of the side at that time was traditional whites with bellpads and crossed baldrics. The baldrics for half the side were orange with red rosettes while the other half were red with orange rosettes. In the 1940's decorated black hats (mainly bowlers) were added to the kit. The Fool and the Hobby Horse began to appear with the side in the early 1950's but the original Hobby Horse (of the 'rider' type) was lost in the fire of Bathampton Village Hall, along with some equipment and records of the side. The costume of the 1950's was a mixture determined by what the men could afford in the difficult post-war period, but was typified by grey flannel trousers. Early in the 1960's the kit was standardised into what it is today. The 'Wyf of Bath' motif was donated to the side by the cartoonist Osbert Lancaster at the end of the decade. In June 1968, at Stratford on Avon, the side danced into the Morris Ring. In recent years we have toured in England, Wales, Ireland, France, Holland, Germany, Spain, Hungary and the Czech Republic promoting friendship, goodwill and the spirit of the Morris. 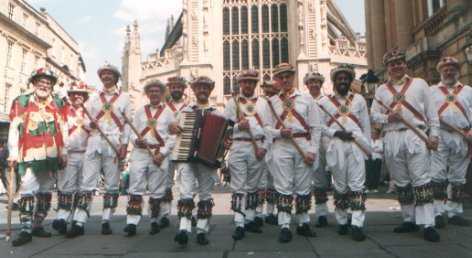 A full history of the Bathampton Morris Men is contained in our handbook "The Bathampton Way".